From Reveal to Birthday Parties, Here’s Fun with a Healthy Twist! Throwing a party to reveal baby’s gender? Or celebrate your little one’s birthday? Modern celebrations are as much about the message as they are the food and festivities. Building anticipation for the big event is an important part of the process, from posting clues and hints on Facebook and supporting the party’s theme on Pinterest to gathering your RSVP’s socially. Start the conversation early and keep it going so that guests experience your gathering as the pinnacle event. Healthy Mom&Baby gathered advice from party planner and caterer Deepa Alfano, at The Creative Spatula in Sarasota so that you can make everything perfect. Skip the tinted cake or beer, gender celebrations with action reveals are really popular right now—especially when you can stage a surprise for everyone involved, including mom and dad. It all begins with asking your healthcare provider to write down your baby’s gender and placing the information into a sealed envelope. Sharing that information with party providers will be easy and allow you to join in on the fun as well. Let the food & refreshments help build the suspense: Tinted sweets and other foods in popular baby colors will keep your secret a little while longer. Here blue and pink owl and elephant cookies invite guests to guess at the gender as they nibble. Be Democratic: Let guests vote blue or pink on a tote board, via a marble jar or by wearing strings of beads in their preferred gender color. Ready, Set, Action! Balloons boxes are fun but so are creatively wrapped silly string canisters, popping confetti-filled balloons, or cracking a colorful piñata that reveals the news! Planning a healthy party for your child doesn’t have to be stressful. Deepa takes themes to the extreme with her fun ideas and favors all while keeping the sugar rush in check. 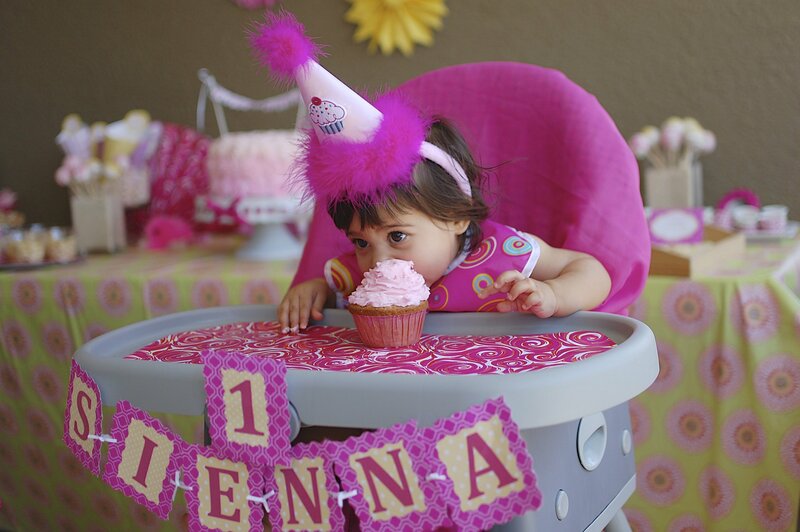 “Emphasize personalized decorations and fun activities over food,” she advises. Deepa started baking her own cookies and cakes because she wanted to skip of all of the additives in store-bought baked goods and mixes. “Even some bakeries use box mixes and use shortening instead of butter, increasing the level of trans fats,” she says. Deepa chooses themes for her daughter’s birthday parties that work well with the healthy foods she plans to serve. For example, her daughter Sienna wanted a rainbow theme party for her third birthday so Deepa served a rainbow of fruit for snacks alongside bites of cucumber and cherry tomatoes with clouds of low fat cream cheese. Of course a birthday cake and cookies were also on the menu, but the children were drawn to the colorful fruit cups first instead of the handmade cookies, she says! Deepa bakes all of her own cakes and cookies from scratch, using all natural ingredients. These simple changes make healthier cakes and cookies that taste great, letting the natural flavors come through instead of drowning them in processed sugar. Substitute ½ of the flour in a recipe with whole wheat flour.